Powers: Paco Perez is essentially a "walking medicine cabinet." His body can produce cures for nearly any disease. History: (X-Force I#117-BTS)- As the new members of X-Force sat down for a briefing on their upcoming mission, the Coach informed them on Paco Perez, a young boy from the People's Republic of Bastrona whose parents were killed by a truck as they tried to make it across the border. 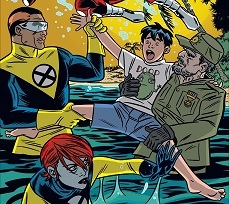 He then informed them that Paco was being held by the Bastronan government and that X-Force was to bring him back to the States. (X-Force#118-119)- X-Force invaded the small country holding Paco Perez on a mission to bring him back to the States. They discovered their purpose in doing this is was so that the U.S. government could experiment on him and harness his powers for medical science. They found him in a medical experimentation lab. 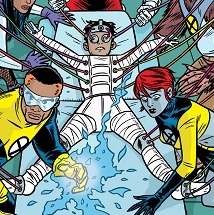 After successfully removing the wires in Paco's brain, the Orphan turned him over to the father of deceased team member Saint Anna, rather than having the government do the same thing that was being done to Paco in the first place. This story was obviously partially inspired by the story of Elian Gonzalez, right down to the Castro-esque dictator on the cover of issue 118 (seen above). Though to my knowledge, Elian didn't have any nifty mutant powers.